What do your clients say about your store? Do they trust you online? If yes, we recommend you to tell other consumers you have name and fame. 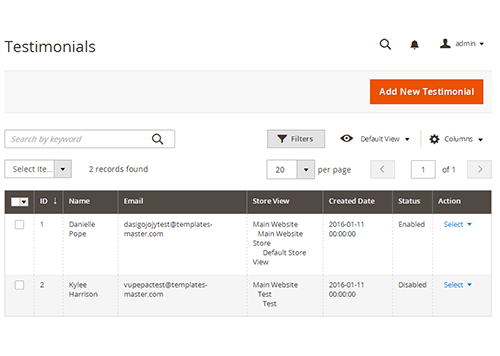 You can do it by placing the testimonials list throughout your Magento 2 store. 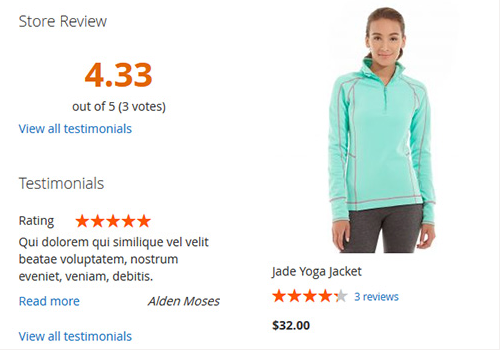 The Testimonials extension for Magento 2 is a push-point to give new visitors a reason to buy in your store. It comes with awesome testimonials listing page created according to the latest design trends. 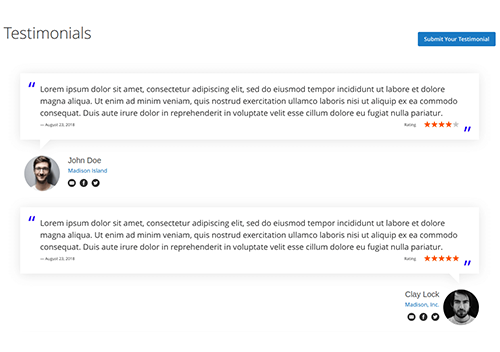 The module also includes a set of widgets. 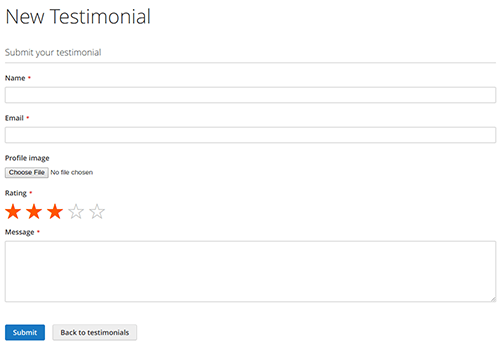 You can show a rotating testimonials list, amazing slider with users testimonials, and so on. 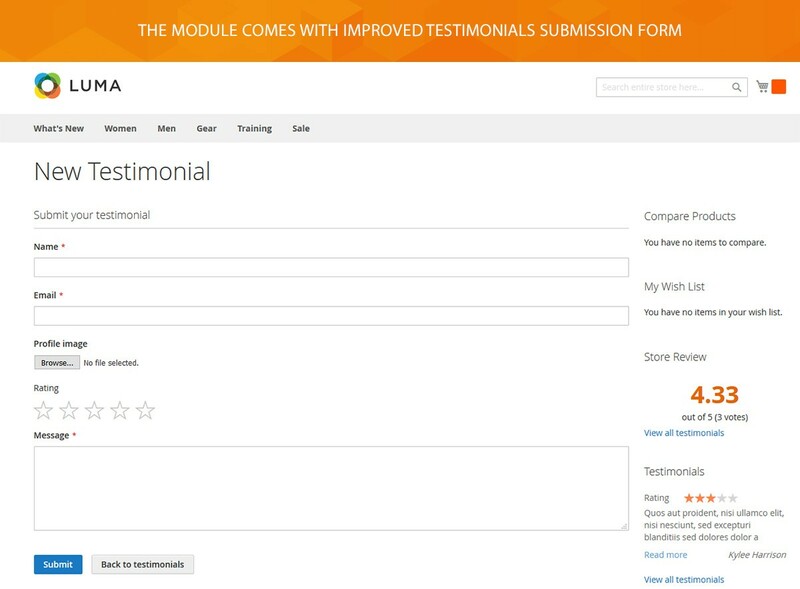 To help your customers submit testimonials, the module provides well-arranged and easy to understand testimonials submission form. Once a new customer posts a review, you will get an email notification. Then you will easily add the user feedback to your website. 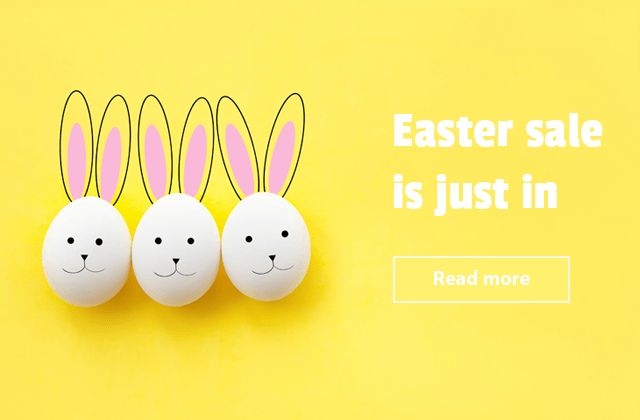 Start collecting testimonials to engage more customers and double sales. Testimonials demo is available at our demo server. 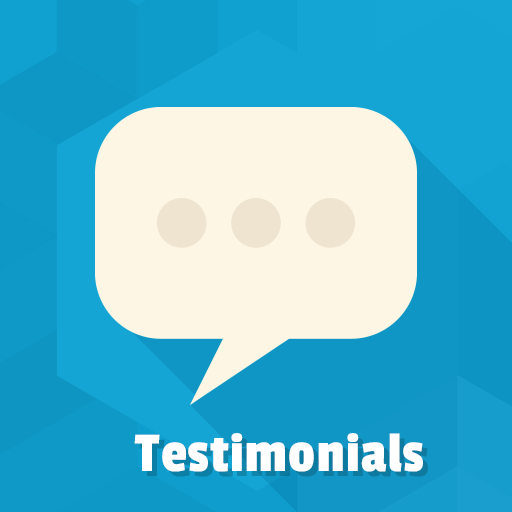 Show beautifully-designed testimonials listing page. Ability to approve new testimonials automatically or manually. The new testimonials will be shown in the grid first. 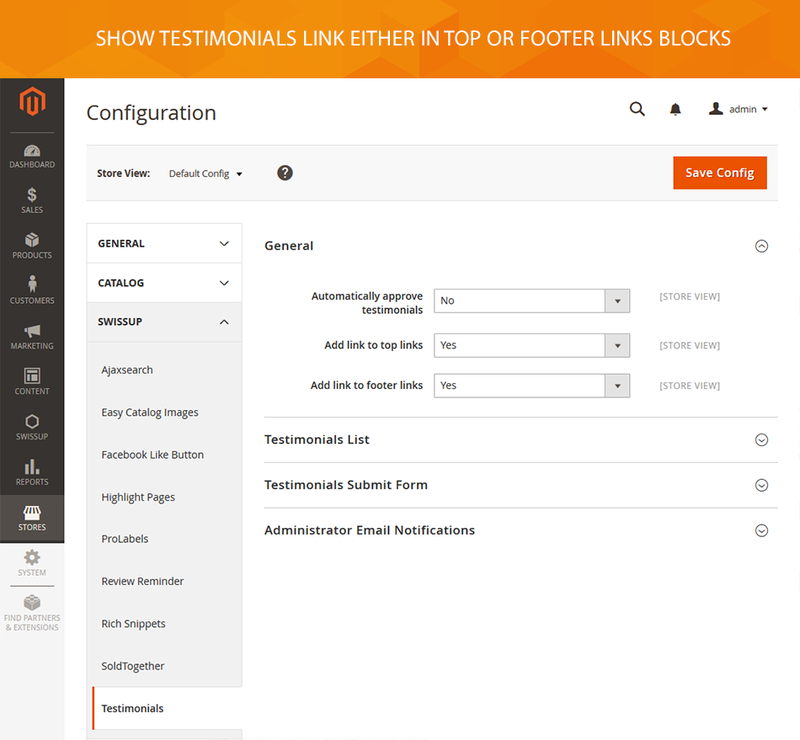 Ability to add a link to testimonials list in top and footer links block. Ability to allow guests to submit testimonials. If disabled, the guests will be redirected to the login page. 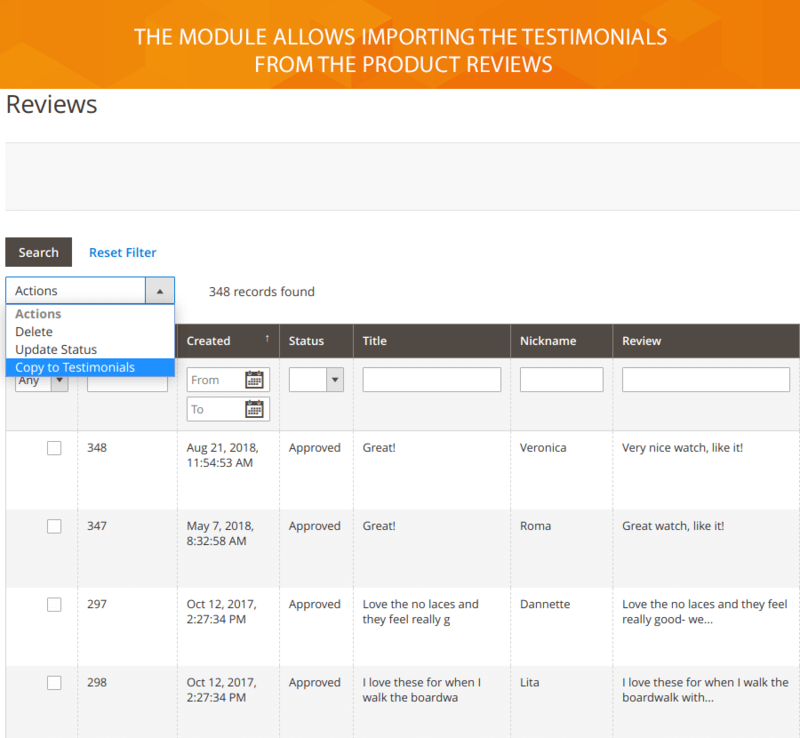 The Testimonials module provides easy to use settings to help you show the most attractive testimonials list. 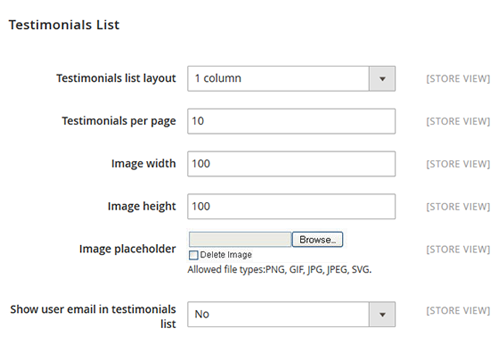 In the module configuration, you can select a testimonials listing page layout, set the number of testimonials shown after page loading, specify the image size, upload the default image in case the user profile image is empty, show/hide the user email from a testimonials listing page. The module comes with great email settings. 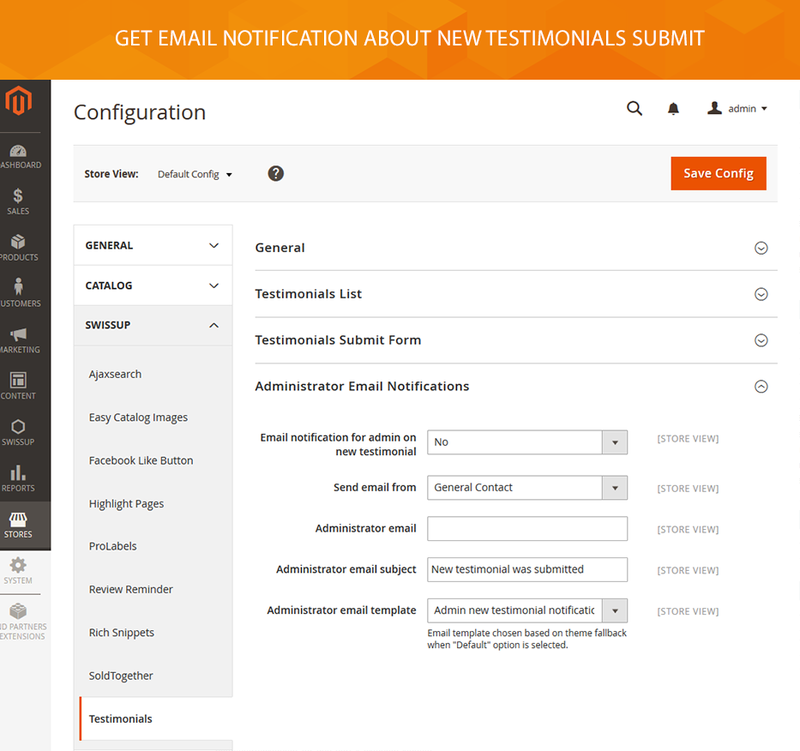 Once the customer posts new testimonials, you will get an email notification. 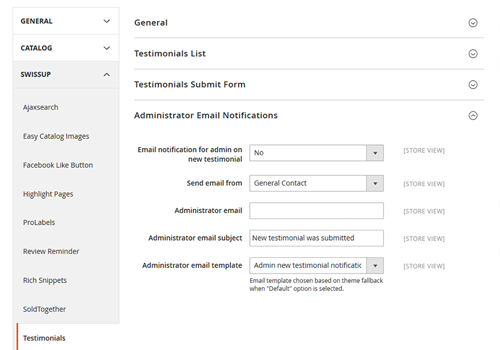 In the extension configuration, you can enable the administrator notification email upon new testimonial submission, choose the contact to send email from, specify the admin email address, specify a subject of email notification, and also choose an email notification template. 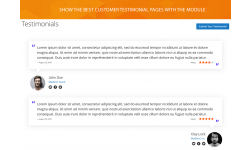 The module comes with many widgets to help you add the testimonials list faster. 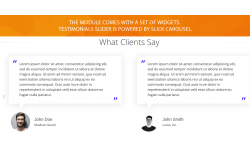 The “Testimonials slider widget” will show the testimonials in a slider powered by Slick Carousel. The “Animated list widget” will show a rotating testimonials list in a side panel. 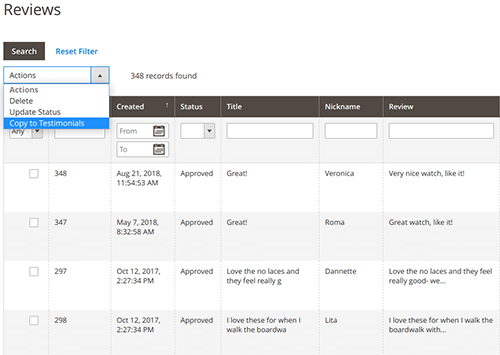 The “Review block widget” will show the number of testimonials as well as an average testimonial rating in a side panel. 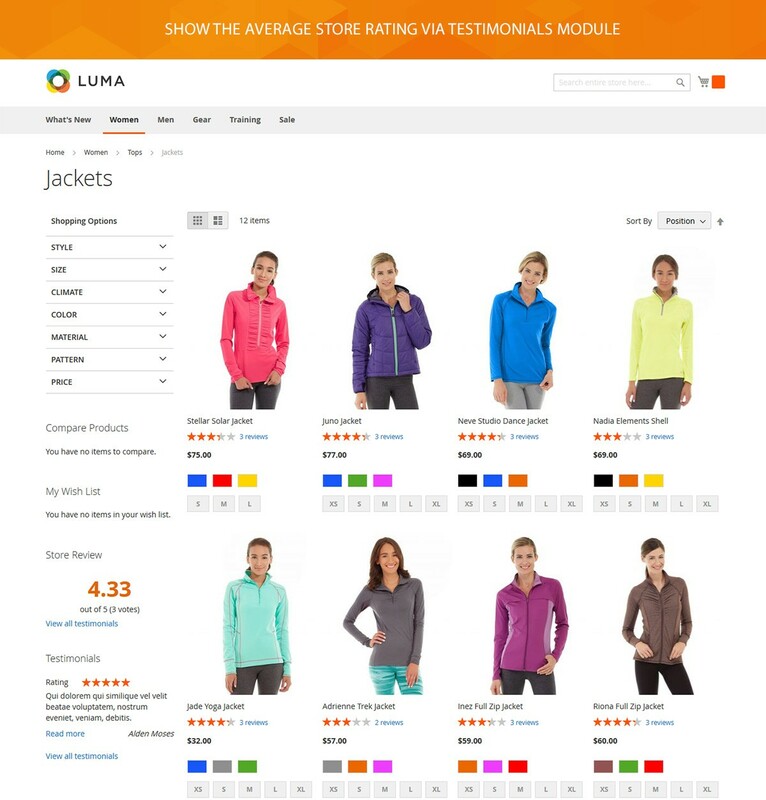 Includes the AggregateRating snippet to display a store rating in search results. 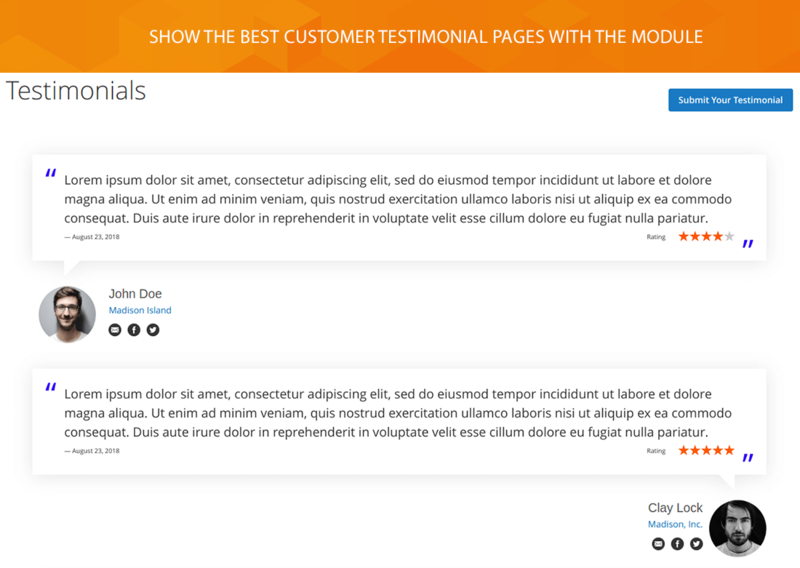 The “Full testimonials list widget” will show a list with all testimonials on custom CMS pages. 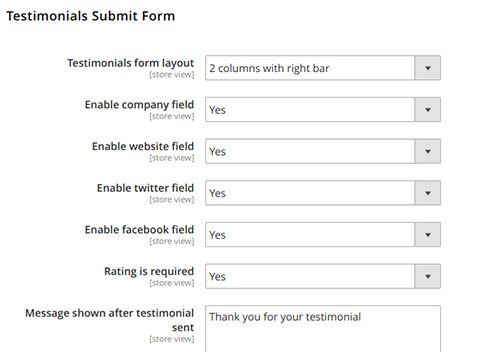 The “Testimonial form widget” will show a testimonials form on custom CMS pages. Set rating a store on a 5-point scale as required. Allow users to specify the Twitter and Facebook accounts. 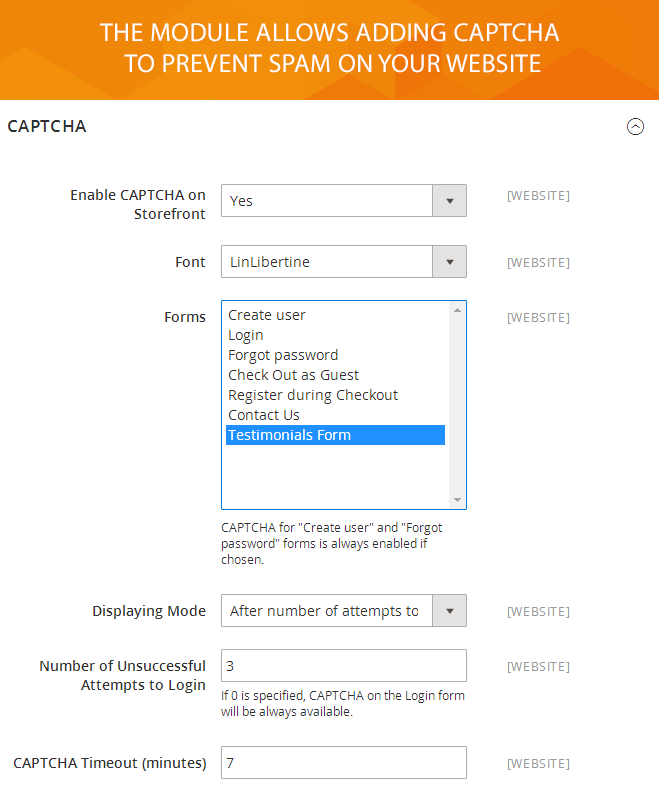 Allow users to specify the company or website name. 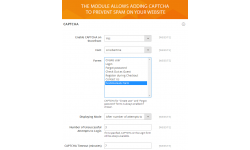 In the module configuration, you can also choose a testimonials page form layout, specify a text message to be shown after testimonials were posted, enable/disable adding testimonials by guests and enable Captcha for protecting spam. 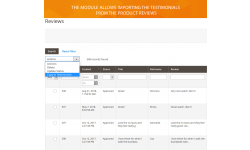 The Testimonials module allows saving the product reviews to the testimonials list. 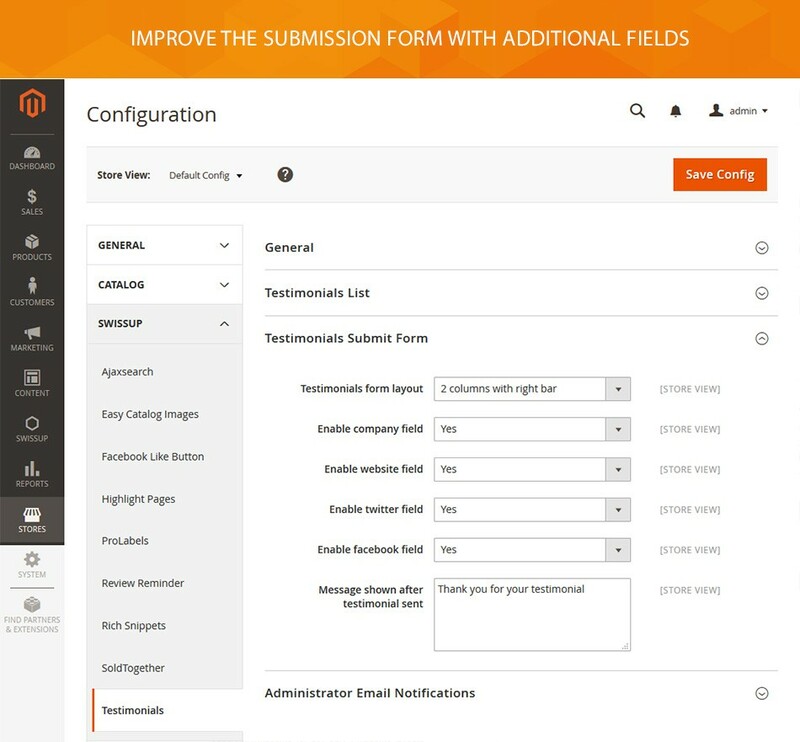 Through the module interface, you can choose the items you want to copy, and run the "Copy to Testimonials" action. In case a product review was posted by a guest, the module will show guest@example.com email for that testimonial. 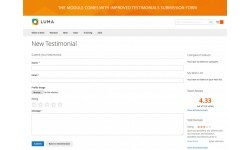 The Testimonials extension provides the easy way to handle every testimonial posted by your customers. 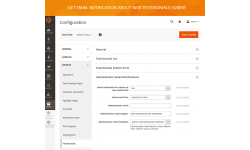 Thus you can check all submitted testimonials, change the testimonials status, delete the testimonials, review the testimonials information, and set to display the testimonials in slide list widget. Minor "Submit testimonial" form improvement to avoid conflict with Magento CSS on storefront.